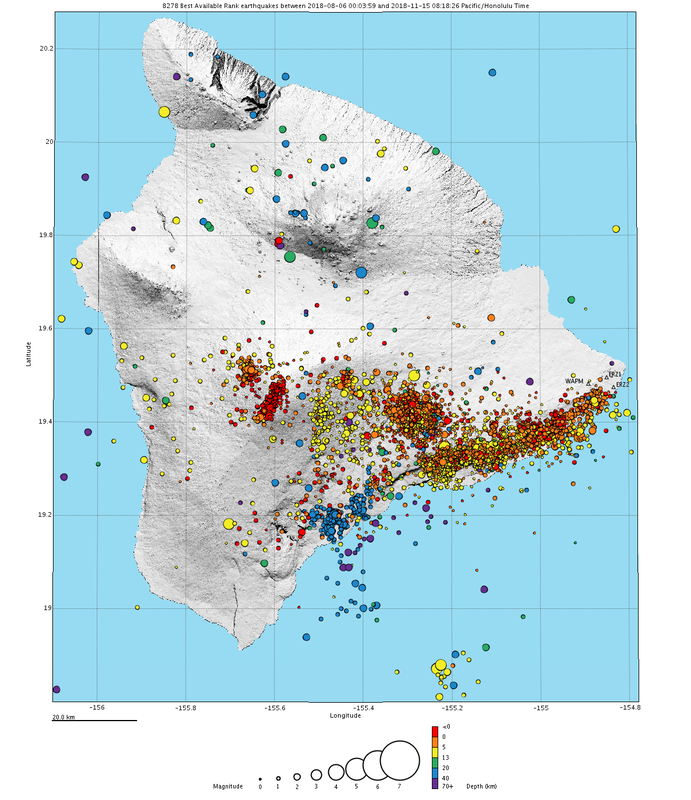 The USGS Hawaiian Volcano Observatory continues to closely monitor volcanoes and earthquakes on the Island of Hawaiʻi. On this map, which shows earthquakes that occurred beneath the island between Aug. 6 and Nov. 14, 2018, the size of each circle depicts earthquake magnitude and color indicates earthquake depth, relative to mean sea level. USGS map. November 2018. Has it already been six months since lava began flowing through Hawai‘i County’s lower Puna District? Has it only been three months since activity at Fissure 8 ended rather abruptly? Similar questions can be asked about the onset and end of the dramatic collapse of Kīlauea Volcano’s summit crater floor. Interesting and important questions for the U. S. Geological Survey’s Hawaiian Volcano Observatory (HVO) staff, our colleagues, and the volcano research community relate to what happened within and beneath Kīlauea. Ultimately, we would also like to know what will happen next on the volcano. Throughout the dramatic volcanic events of the summer, HVO’s work continued, as has the institution of HVO. Fortuitously, as the summit began to shake with the regularity of large crater collapse events and as lava flows began their advance in lower Puna, the University of Hawai`i at Hilo (UHH) was in summer session. UHH and its Geology Department generously opened offices and labs to HVO staff—evacuated from Hawai`i Volcanoes National Park upon its closure—where they could work in temporarily available space. Had university classes been in full session, this would not have been possible. What made such a rapid move even thinkable was the thoughtful design of HVO’s data and information technology infrastructure. While HVO’s critical IT infrastructure remains in the National Park, it was possible to reroute HVO monitoring data streams and processing to UHH. This was by no means a small accomplishment. At the end of the summer session, it was necessary for HVO to move from UHH’s Geology Department. HVO staff and equipment are now in a second set of temporary work and storage spaces spread across five buildings and three locations, including UHH and the Port of Hilo. In the near future, HVO will move to a third temporary location so that a larger fraction of the staff will be able to work under a single roof. Like other displaced Hawaiʻi residents, HVO staff continue to adapt and remain flexible in transient and challenging times. Discussions and planning regarding HVO’s future permanent location are ongoing. There are many considerations and factors that will influence the eventual decisions. Experiences gained from Kīlauea’s 2018 episode will also inform these decisions, as they provided new insights, especially regarding data distribution, remote monitoring of volcanic activity, and working collaboratively with partners across the whole country. In the meantime, HVO continues to vigilantly watch both Kīlauea and Mauna Loa volcanoes. 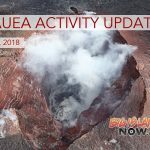 Since the relatively abrupt end to Kīlauea’s summit collapse sequence and lower East Rift Zone lava flows in early August, HVO has not noted any trends suggesting that the volcano is building toward imminent renewed eruptive activity. Typical of intervals without active eruptions, seismic activity is the primary indicator of what’s happening inside Hawaiian volcanoes. Seismicity at Kīlauea continues beneath its summit and south flank. But, rather than the thousands of earthquakes that were recorded each week between June and August 2018, recent earthquake rates have persisted at several hundred per week. 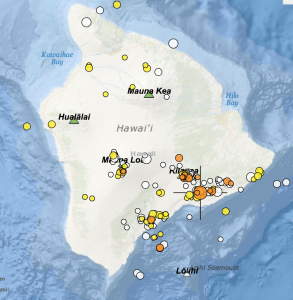 Many of these earthquakes can be considered aftershocks of the magnitude-6.9 Kīlauea south flank earthquake that occurred on May 4, 2018. 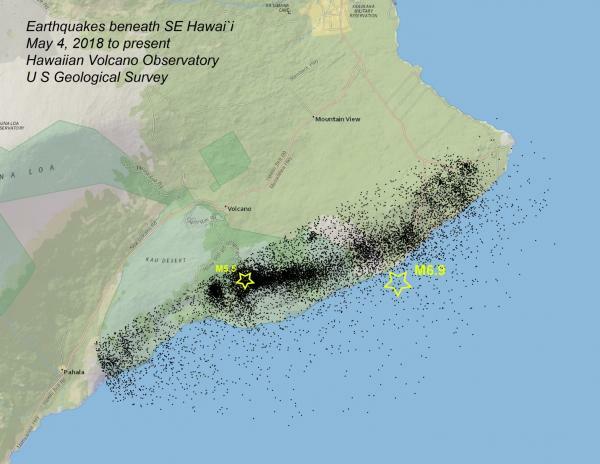 Since early August 2018, minor seismic activity has returned to the upper elevations of Mauna Loa. A brief flurry of small earthquakes began beneath the summit and uppermost Southwest Rift Zone in mid-September, followed by a sequence of earthquakes beneath the volcano’s upper west flank. Seismicity beneath these regions continued through mid-October but has since decreased. Importantly, HVO notes no significant geodetic changes at Mauna Loa associated with this seismic activity. 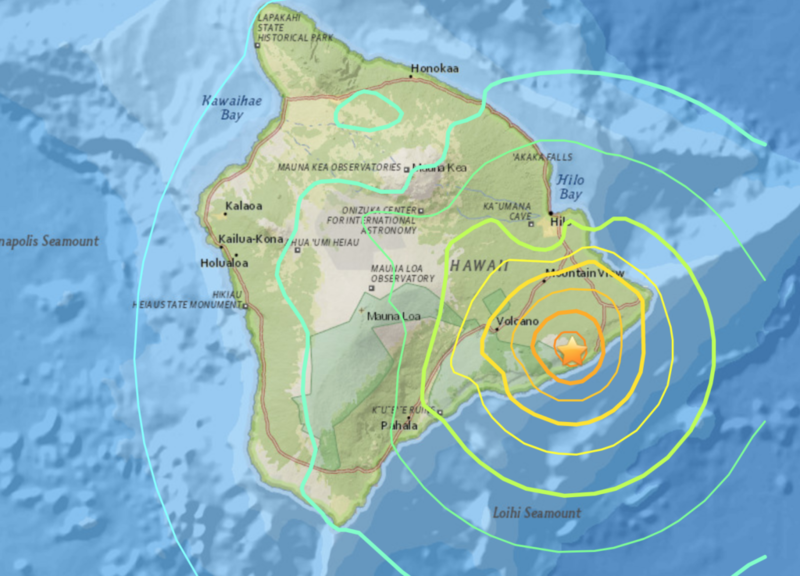 Lōʻihi, a submarine volcano south of Hawaiʻi Island, and other earthquake source regions have also been seismically active. As an institution, HVO is settling into a new “normal.” HVO’s future office moves should not be as sudden as those required this past summer, nor will they adversely impact HVO’s monitoring of the island’s active volcanoes. Unlike volcanic eruptions that eventually end, HVO’s work continues nonstop.